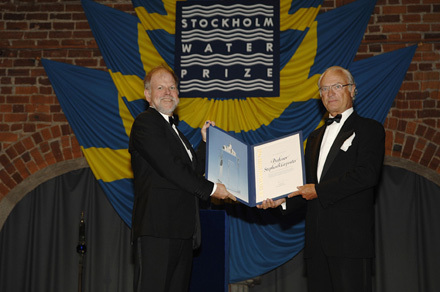 Stephen R. Carpenter, Professor of Zoology and Limnology at the University of Wisconsin-Madison, USA, received today the 2011 Stockholm Water Prize by H.M. King Carl XVI Gustaf of Sweden for his groundbreaking research that showed how lake ecosystems are affected by the surrounding landscape and human activities. The Stockholm Water Prize Nominating Committee emphasized the importance of Professor Carpenter's contributions in helping us understand how we affect lakes through nutrient loading, fishing, and introduction of exotic species. "Professor Carpenter has shown outstanding leadership in setting the ecological research agenda, integrating it into a socio-ecological context, and in providing guidance for the management of aquatic resources," noted the Stockholm Water Prize Nominating Committee. Upon receiving the prize, Professor Carpenter said he was excited that many years of work on trophic cascades are recognized. "The prize is an opportunity to intensify my work on agriculture and freshwater. The connections between food and water security have never been more important, as we need an agriculture that can feed 9 billion people while maintaining the water supplies and other ecosystem services that people need. Agriculture impacts freshwater today through withdrawals, runoff pollution, biodiversity loss and climate change." Professor Carpenter is Stephen Alfred Forbes Professor of Zoology. He serves as the Director of the Center for Limnology at the University of Wisconsin-Madison. He is a member of the US National Academy of Sciences, a fellow of the American Academy of Arts and Sciences, a foreign member of the Royal Swedish Academy of Sciences, and an affiliate of the Chinese Academy of Sciences. He has played a leading role in the Millennium Assessment - a global assessment of the health of the world's ecosystems. Born in 1952, Professor Carpenter lives in Madison, Wisconsin. The Stockholm Water Prize Laureate receives USD 150,000 and a crystal sculpture specially designed and created by Orrefors a Royal Ceremony earlier this evening at Stockholm City Hall. The event was held as part of the annual World Water Week in Stockholm. Photograph courtesy of SIWI. The Stockholm Water Prize is a global award founded in 1991 and presented annually by the Stockholm International Water Institute to an individual, organization or institution for outstanding water-related activities. The Stockholm Water Prize Laureate receives USD 150,000 and a crystal sculpture specially designed and created by Orrefors. 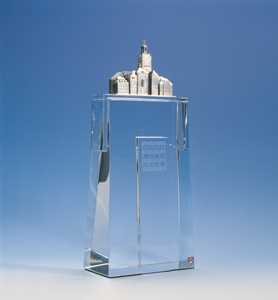 Founders of the Stockholm Water Prize are Swedish and international companies in collaboration with the City of Stockholm. They are: Bacardi, Borealis & Borouge, DuPont, Europeiska Insurance, Fujitsu, Grundfos Management, Hewlett Packard, ITT Water & Wastewater, Kemira, KPMG Sweden, Läckeby Water, P&G, Ragn-Sells, Saab Automobile AB, Scandic, Scandinavian Airlines (SAS), Siemens AG, SJ (Swedish Railways), Snecma/Safran, Uponor, Water Environment Federation and Ålandsbanken Sverige. This news is from World Water Week, 25 August 2011.